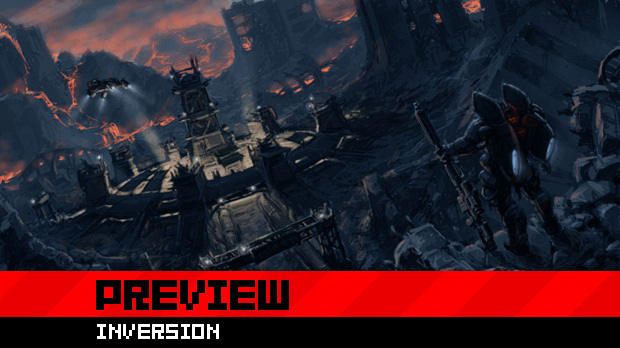 Take Gears of War, add gravity mechanics and a bit of a TimeShift vibe, and you have Inversion. We got to try out two-player co-op in a campaign level during gamescom, and yep, it was a cover-based shooter with bulky men who shoot bulky non-human-looking enemies. A race called the Lutadore have attacked the homeworld of Inversion's two protagonists, and after being captured, they inevitably escape with some of the enemy's technology: something called the Gravlink. Using this device, you can manipulate gravity in a couple of ways. Creating a high-G field makes enemies get stuck in their place. Creating a low-G field makes them float around (e.g., Mass Effect's singularity biotic power), after which you can use the Gravlink to grab them in mid-air, yank them towards you, and stomp them to the ground or simply shoot them full of lead (e.g., Bulletstorm, Mass Effect's pull biotic power). Alternatively you can use the Gravlink device to do area attack on the ground around you (e.g., a thousand other games). These abilities seemed to work fine for the most part, although they aren't exactly of the most inspiring or innovative kind you'll ever see in a game. The interesting thing about Inversion is that you can jump to wall or ceilings and continue combat there. 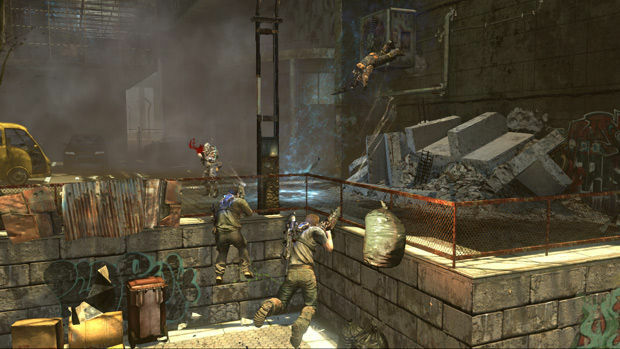 However, it looked like these instances were mostly there to mess with your sense of balance as you hop to gravity-defying surfaces between combat encounters, or act as a way to get to the "ground level" with your foes rather than getting shot from above and dying. 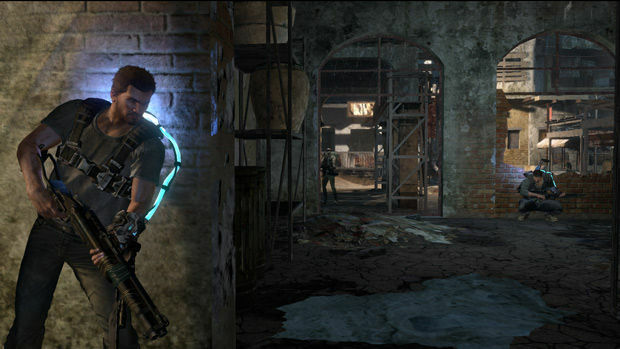 Everything else from the third-person perspective to the cover mechanic and the over-the-shoulder aim felt like a carbon copy of Gears of War. Not that it necessarily has to be a bad thing, if you can make it stand out from that game's third chapter when you launch a game a few months later, but Inversion looked so much like its obvious inspiration that it comes closer to being derivative. Basically, you enter an open area with your AI or co-op partner, enemies that look like Locust come swarming in -- sometimes from the walls or shooting from the ceiling -- and you take cover while you destroy them. If you want, you can grab an enemy and use him as a meat shield for as long as his limbs stay attached to his body. At one point, you even enter a cutscene where you take cover at a few barricades in front of a large open area, where you shout some manly words of war before assaulting the enemy. 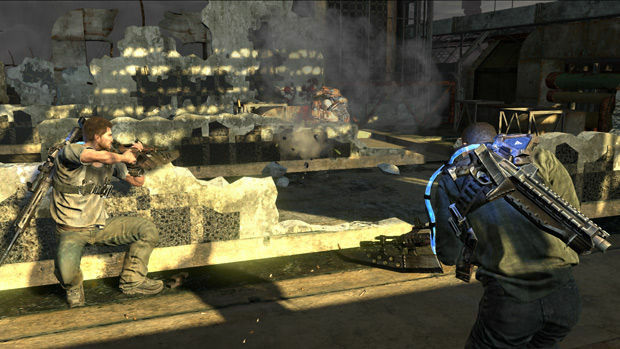 Now, it has been a while since I've played Gears of War 2 so I might be wrong about this, but I seem to remember an almost exact same cutscene with Marcus and Dom taking cover near a fountain, where they hold a similar kind of manly talk before returning control to the player so you can start blasting some Locust. There's still some cool touches to Inversion, like being able to grab flammable liquid from a barrel and using it to immolate a group of enemies, but I couldn't help feeling I had played the same game a dozen times before. The last game that tried to mimic Gears, Quantum Theory, wasn't exactly a runaway success either. On some level, the ideas behind Inversion are novel enough to allow for a great game to emerge, but what I played just felt too "safe" to me. A game like this begs for some great and mind-bending level design to fully capitalize on being able to jump to any surface and flank the enemy from walls or ceilings. But it looked like it would be mostly a linear affair, with predetermined blue glowing flows of particles indicating where you are supposed to scale a wall and where you can jump to the ceiling. There has to be more you can do with the potential of a gravity mechanic than just inserting these instances between one open field of enemies and cover, and the next one. Namco Bandai showed Inversion at gamescom last year, and since then it's been relatively quiet about the title. Thankfully, there was a Namco PR person at the demo to ask what happened, but the answer was that Namco wanted to take its time to properly promote the new IP. Of course, Namco's last two new IPs -- Enslaved and Majin and the Forsaken Kingdom -- were imperfect critical darlings that were either improperly marketed or simply failed to sell. When asked if they had learned anything from those experiences that they would apply to Inversion, especially with The Darkness II being delayed to the same release date, the only response was carefully worded PR speak for "actually we don't really know what the hell we're doing." 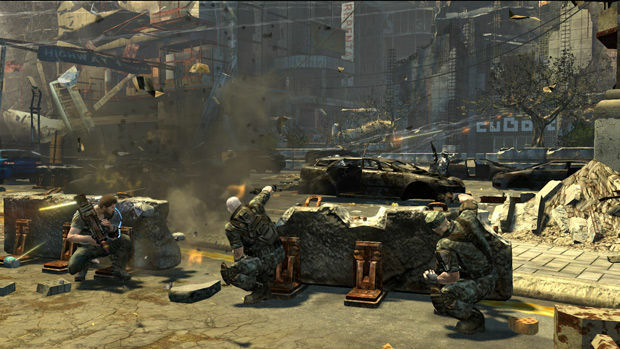 I actually liked Saber Interactive's TimeShift for trying to do something different, even if it didn't always work out for the better, so I do hope the level design in the full game will be better than what they showed at gamescom. But for now, Inversion is pretty much off my radar. Oh, and there's 16-person multiplayer to distract the developers from creating a focused single-player experience. I'm sure that will pay off in a big way.